The Council on Foreign Relations was founded just after World War I to bridge a gap between U.S. foreign policy and the country’s interests overseas. In 1921, with much of the world still reeling from the Great War, the United States had emerged as a major power and yet was drifting toward isolationism. This was a result, in part, of a lack of consensus among the White House, Congress, and the American people on how involved the country should be abroad; it also reflected a long-standing popular mindset. The mission of those who created CFR was to arrest this drift and make the case to those in power and to the public at large for ongoing American engagement in the world. Nearly one hundred years later, the United States faces a different but no less difficult world. In Asia, nationalism is on the rise as the world’s most populous countries and some of its largest economies increasingly compete for regional primacy. The Middle East, where the United States has expended enormous resources and attention over the past decade, remains central to global energy supplies but is mired in conflict and instability. For the first time in decades, Europe faces challenges to its prosperity and peace, with uncertain prospects for economic growth and renewed Russian assertiveness. There are also a host of issues—including climate change, terrorism, infectious and noninfectious diseases, trade, and cyberspace—wherein global arrangements are inadequate for the challenges at hand. At the same time, the United States faces domestic problems that threaten the underpinnings of its strength. Political dysfunction calls into question the government’s ability to address complex and pressing issues ranging from immigration and infrastructure to taxation and entitlements. On foreign policy, there is no consensus on either U.S. objectives in the world or how they should be pursued. Against this background, in the face of persistent difficulties at home, and following two costly wars, a growing number of Americans believe that the United States should sharply limit its role in shaping international affairs. A world of complex challenges, a lack of domestic agreement on what to do about them, and a growing desire to distance the United States from the world: history may not be repeating itself exactly, but there are clear parallels. As a result, CFR has both the opportunity and the obligation to again make a meaningful difference. Richard N. Haass and Hassan Rouhani, president of the Islamic Republic of Iran (with interpreter, center), meet before an event cosponsored by CFR and the Asia Society. Indeed, CFR, with its reputation for nonpartisanship, intellectual independence, extraordinary membership, and deep bench of experts, is uniquely positioned to do just that. CFR contributes to a more informed and considered foreign policy debate and, in an increasingly polarized era, serves as a trusted resource for officials and the public alike. The institution also continues to engage communities that have a growing influence on world affairs and educate the public about how realities abroad affect conditions at home. CFR’s contributions begin with the David Rockefeller Studies Program, which produces scores of publications every year, convenes hundreds of roundtable meetings, and provides expert briefings for congressional and executive branch officials that highlight emerging challenges and suggest ways of solving, or at least managing, them. CFR’s more than seventy full-time and adjunct fellows include scholars and former practitioners alike, with expertise in critical countries and regions and specialties spanning diplomacy, strategy, and economics. As the world has changed, the institution’s focus has widened to include emerging issues such as geoeconomics, energy and climate change, global health, and Internet governance. In recognition of the growing link between international and domestic issues, the think tank also considers critical challenges at home. The Renewing America initiative is predicated on the belief that America’s strength abroad depends on its ability to address domestic issues ranging from immigration and infrastructure modernization to education, tax policy, and entitlements. CFR is committed to engaging the public and promoting the importance of international issues. Through its role as a membership organization and a publisher, CFR remains a venue for discussion and debate and a platform for generating innovative thinking. The Meetings and Membership Program brings leaders from business, government, the media, academia, and civil society together to address the most important issues facing the country and the world. In the words of Timothy F. Geithner, then U.S. treasury secretary, “You don’t go to speak to the Council; you go to get advice.” Foreign Affairs magazine continues to serve as the preeminent public forum for analysis of international issues. This year alone saw pieces on subjects ranging from drone warfare and synthetic biology to China, shale, and big data. In addition to being a resource for an experienced, accomplished, and diverse membership, CFR is a trusted, authoritative resource for the broader public. In the midst of an increasingly polarized political discourse, the institution has distinguished itself as truly nonpartisan. Points of view across the political and ideological spectrums are heard. Members of both parties are active as speakers, contributors, fellows, and members. Openness to thoughtful opinion is a hallmark of CFR. CFR is also committed to engaging the public and promoting the importance of international issues. A number of products are designed specifically to provide background on complex foreign policy issues, and in recent years, CFR has increased its investment in new technologies, resulting in work that is more accessible, more compatible with online use, and more easily shared across new distribution platforms. Meanwhile, dedicated outreach programs make relevant resources available to nontraditional constituencies—including religious leaders and scholars and individuals active at the state, local, and community levels—that have an increasing role in international affairs. We are likewise focused on reaching students at the college and advanced high school levels, and in addition to designing programming specifically for them and their teachers, CFR provides enhancements to publications that help integrate global issues into classrooms. Our hope is that, through these efforts, we can instill in the next generation a basic understanding of, and an abiding interest in, international affairs and foreign policy. As we approach CFR’s one hundredth anniversary, this is a good moment to take stock. Today’s world in some ways resembles that of a century ago, when this organization was founded—and even where it is different, what CFR has to offer is highly relevant. Once again, this country and its citizens face important decisions, and we here at CFR are committed to ensuring that the organization is in a position to continue to serve as a trusted, authoritative resource for its nearly five thousand members, for the broader society, and for those in positions of particular influence. This year, 250 events in New York and Washington brought CFR members into dialogue with leaders and experts on many of the most pressing questions facing the United States and the world. The program year began with the UN General Assembly in September, during which a number of world leaders—including Iranian president Hassan Rouhani, on the eve of his historic meeting with U.S. president Barack Obama—addressed CFR members. In June, the program year ended with visits from two former secretaries of state in one day: Hillary Rodham Clinton, who spoke about seminal moments in her career for a session of the HBO History Makers series; and Madeleine K. Albright, who opened the annual National Conference with a discussion on American diplomacy. With a convening power that is unmatched, CFR opened its doors to twenty-three heads of state and foreign officials, including the presidents of Turkey, Tunisia, and Cyprus; the prime ministers of Spain, Italy, Australia, and Malaysia; and the foreign ministers of Iraq, Iran, Egypt, Cuba, and Italy. Leaders of international institutions, including World Bank president Jim Yong Kim, shared their views, and U.S. officials—including Treasury Secretary Jacob J. Lew, Secretary of Agriculture Thomas J. Vilsack, CIA director John O. Brennan, UN ambassador Samantha Power, and White House coordinator for defense policy Elizabeth Sherwood-Randall—continued to look to CFR as a forum and source for nonpartisan discussion and debate. Former secretary of defense Robert M. Gates and former Federal Reserve chairman Alan Greenspan also joined members to offer insight gleaned from their long tenures in government. And for the thirteenth time since 1998, CFR welcomed the service chiefs of the Air Force, Army, Marines, and Coast Guard, with Vice Admiral Michelle Howard representing the Navy. 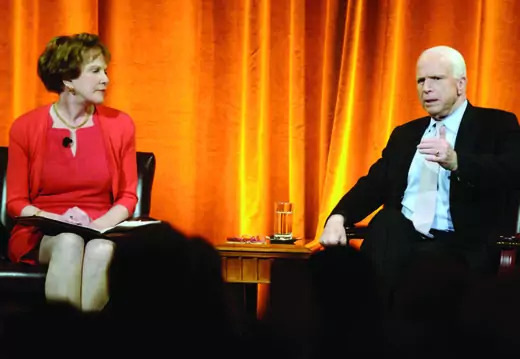 Margaret G. Warner and John McCain discuss Ukraine, the Middle East, and the future of the Republican Party. CFR also hosted leaders in business, media, academia, and civil society, including Bridgewater Associates founder and chief investment officer Ray Dalio, and Mo Ibrahim, chairman and founder of the Mo Ibrahim Foundation. This year’s Daughters and Sons events, designed for members’ high school and college-age children, featured, among others, David Miliband, president of the International Rescue Committee and former foreign secretary of the United Kingdom, and George Stephanopoulos, chief political correspondent for ABC News and former communications director for President Bill Clinton. Meetings continued to respond to world events in a timely manner. In a new series, “What to Do About . . . ,” discussions take the form of a National Security Council meeting, with panelists acting as counselors to the president. Panels offered analyses of and policy prescriptions for some of the most daunting issues in American foreign policy, including Russia and Ukraine, Syria, Egypt, Iraq, tensions in the South and East China Seas, and the Guantánamo Bay detention center. Other new series focused on emerging talents and trends. “Voices of the Next Generation” invites rising young leaders to share their insights and has featured sessions with Facebook cofounder and publisher of the New Republic Chris Hughes and economist Raj Chetty, one of the youngest professors to earn tenure from Harvard University’s economics department. Another new series is devoted to the exploration of new technologies and their potential effect on security, economics, trade, and other transnational issues. Sessions this year examined 3-D printing, Bitcoin, and driverless cars. Scholars produced three new books this year: No Exit from Pakistan: America’s Tortured Relationship with Islamabad, by Senior Fellow Daniel S. Markey, tells the story of U.S. entanglement with Pakistan and suggests how the United States can learn from its past mistakes and aim for the best while preparing for the worst. Senior Fellows Elizabeth C. Economy and Michael A. Levi authored By All Means Necessary: How China’s Resource Quest Is Changing the World, which challenges conventional wisdom about the impact of China’s global pursuit of raw materials. In his book Maximalist: America in the World from Truman to Obama, Senior Fellow Stephen Sestanovich compares the Obama administration’s foreign policy strategy to those of other presidents who oversaw the end of major wars, tracing American history through periods of overreaching and underreaching foreign policy. In addition to these books, CFR scholars authored more than 40 reports, papers, and memoranda; 51 journal and magazine articles; 358 op-eds; and 1,400 blog posts. They also convened 256 roundtable meetings this year. On economic policy, scholars contributed substantial and wideranging reports through the Maurice R. Greenberg Center for Geoeconomic Studies as well as other programs and initiatives of the think tank. “Restoring Financial Stability in the Eurozone,” by Senior Fellow Benn Steil and Analyst Dinah Walker, proposed that the European Central Bank model its stress tests after those conducted by the United States in 2009. Senior Fellow Robert Kahn’s Global Economics Monthly newsletter continued to provide insight on major news stories and macroeconomic trends, such as potential Russian sanctions, and lessons learned from the fall 2013 fiscal standoff in Washington. 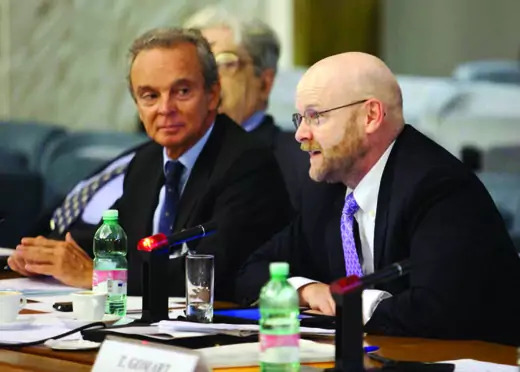 Senior Vice President and Director of Studies James M. Lindsay leads a discussion on global governance issues at a Council of Councils conference in Rome. The Middle East remained a challenge for American foreign policy and was the topic of several reports this year, including Senior Fellow Elliott Abrams’s “The Israeli-Palestinian Negotiations: Aiming ‘Low’ or ‘High,’” which advocated a peace process built on pragmatic, achievable goals. In “How to Promote Human Rights in Iran,” Senior Fellow Ray Takeyh proposed that the Obama administration integrate a human rights agenda into talks with Iran on its nuclear capabilities. Two additional Policy Innovation Memoranda addressed violent extremism in the region: Senior Fellow Ed Husain argued for the creation of a global venture to support local and community organizations throughout the Middle East to promote alternatives to violent extremism, and National Intelligence Fellow Charles E. Berger proposed a U.S.-funded rehabilitation center for terrorists to help counter the spread of al-Qaeda in the Arabian Peninsula. The think tank also furthered its focus on U.S. strategy in Asia. In his Council Special Report Reorienting U.S. Pakistan Strategy: From Af-Pak to Asia, Daniel Markey proposed that the United States decouple its strategies toward Pakistan and Afghanistan and begin to integrate Pakistan into its broader Asia strategy. Senior Fellow Joshua Kurlantzick’s Working Paper “Southeast Asia’s Regression From Democracy and Its Implications” analyzed the movement toward political repression in the region. Senior Fellow Alyssa Ayres argued in a Policy Innovation Memorandum, “Bringing India Inside the Asian Trade Tent,” that the United States should strengthen economic ties with India by supporting its bid for admission to the Asia-Pacific Economic Cooperation forum. Now in its third year, the Renewing America initiative continued to examine the domestic underpinnings of U.S. power abroad in reports such as “Remedial Education,” which revealed the widening achievement gaps that have made the U.S. education system less competitive. “Curtailing the Subsidy War Within the United States,” by Senior Fellow Edward Alden and Associate Director Rebecca Strauss, presented a plan to discourage states from offering major subsidies—in the form of tax breaks, land grants, and other incentives—to businesses. 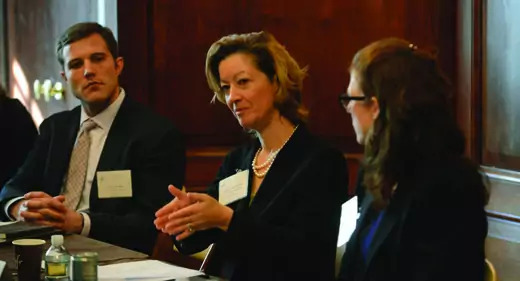 And Senior Fellow Heidi Crebo-Rediker’s “Infrastructure Finance in America—How We Get Smarter” urged the Obama administration to create an office within the Treasury Department to advise state and local governments on how to mobilize private-sector financing. The Center for Preventive Action (CPA) focuses on the prevention or resolution of conflicts and crises around the world. This year, CPA released Senior Fellow Steven A. Cook’s Contingency Planning Memorandum “Egypt’s Solvency Crisis,” which outlined the risks and warning signs of insolvency as well as proposals to prevent or mitigate it. One of the center’s most recent contributions was Limiting Armed Drone Proliferation, a Council Special Report by Fellow Micah Zenko and Stanton Nuclear Security Fellow Sarah Kreps, that argued for clear rules on drone usage and sales to limit proliferation of a weapon with destabilizing capacities. Earlier, Zenko wrote “Dangerous Space Incidents,” a Contingency Planning Memorandum that focused on the potential for attacks on satellites to exacerbate international crises back on earth. CPA also released Afghanistan After the Drawdown, a Council Special Report outlining the composition, role, and rationale for roughly ten thousand U.S. troops remaining in the country. Public health has become increasingly relevant to international affairs, and is likewise an increasing focus of the think tank’s work. Senior Fellow Thomas Bollyky released two Expert Briefs on tobacco use and regulation in the United States. The first, “The Tobacco Problem in U.S. Trade,” focused on the tension between the government’s responsibility to promote trade and its efforts to curb tobacco use, a conflict illuminated by the discussions surrounding the Trans-Pacific Partnership. Bollyky also wrote “How to Save Electronic Cigarettes,” which argued that better restrictions—especially declassifying electronic cigarettes as tobacco products—would facilitate their sale and help more people quit smoking. Other highlights from the Global Health program included Senior Fellow Laurie Garrett’s Policy Innovation Memorandum “Making the New Revolutions in Biology Safe,” which showed how the lack of regulations surrounding scientists’ ability to manufacture living organisms could have potentially harmful consequences for medicine, technology, and health. Senior Fellow Heidi Crebo-Rediker moderates a breakout session during this year’s Term Member Conference. The think tank also welcomed several new fellows who embody CFR’s signature balance of scholarship and practitioner experience, including Alyssa Ayres, former deputy assistant secretary of state for South Asia; Heidi Crebo-Rediker, the first chief economist at the State Department; Janine Davidson, former deputy assistant secretary of defense; Stanley Fischer, former governor of the Bank of Israel; Fred Kaplan, author of The Insurgents: David Petraeus and the Plot to Change the American Way of War, a 2014 Pulitzer Prize finalist; Raymond W. Kelly, former New York City police commissioner; Mervyn King, former governor of the Bank of England; Karen Kornbluh, former U.S. ambassador to the Organization for Economic Cooperation and Development; and Jere Van Dyk, journalist and author of Captive: My Time as a Prisoner of the Taliban. The Council of Councils (CoC) is a CFR-organized network of leading policy institutes from around the world that aims to encourage cooperation and exchange on issues of global governance. The CoC met four times this year—at its annual conference in New York and at regional conferences in Rome, Mexico City, and Sydney. The conference in New York covered a range of transnational challenges, from Internet regulation to armed drones, and included discussions on humanitarian intervention and international finance. In Rome, programming focused on the future of the eurozone, the Transatlantic Trade and Investment Partnership, and the geopolitics of energy, while Mexico City’s sessions centered on trade, organized crime and narcotics, and energy security in Latin America. The conference in Sydney focused on global trade, Internet governance, and maritime security in the Asia-Pacific region. Participants plan to introduce their recommendations to high-level foreign policy circles within their own countries. Launched in 1995, the Independent Task Force Program convenes diverse groups of experts with the aim of reaching meaningful, policy-driven consensus on critical and emerging international issues. Task Forces are nonpartisan and their deliberations are private. Once formed, they are fully independent; members alone are responsible for the content of their reports, which issue recommendations intended to influence policy and the public dialogue. The program launched two Task Forces this year. The first, on North America, is chaired by former CIA director David H. Petraeus and former World Bank president Robert B. Zoellick and is directed by Senior Fellow Shannon K. O’Neil. The group is focusing on ways to encourage North American integration into and cooperation on trade, security, migration, energy, and infrastructure, and it will offer concrete recommendations on how the United States can enhance the region’s competitiveness in the world by deepening ties with Mexico and Canada. The second Task Force, directed by Senior Fellow Tom Bollyky, examines the deepening crisis of noncommunicable diseases (NCDs) in low- and middle-income countries. Chaired by Purdue University president and former Indiana governor Mitchell E. Daniels and former national security adviser Thomas E. Donilon, the Task Force will be the first at CFR devoted to a global health issue and will consider NCDs’ implications for international economic development and national security. Both Task Forces are scheduled to issue their recommendations and reports in fall 2014. The National Program convened more than one hundred events in thirteen cities around the country and the world—Atlanta, Boston, Chicago, Dallas, Houston, London, Los Angeles, Miami, Phoenix, San Diego, San Francisco, Seattle, and Tokyo—on topics including technology, security, and global health. Notable meetings featured discussions on the CFR-sponsored Independent Task Force report on digital policy, with Chairs John D. Negroponte and Samuel J. Palmisano and Project Director Adam Segal; on education policy, with Elizabeth Swanson, deputy chief of staff to Chicago mayor Rahm Emmanuel; on the rise of big data, with Economist data editor Kenneth Cukier; and on the evolving role of social media in U.S. statecraft, with Mobile Future chairman Jonathan Spalter. The National Program also connected members to events in New York and Washington through teleconferences and live streams. As always, a cornerstone of programming was the annual National Conference, which hosted members in New York for three days of programs and discussion. This year’s conference featured prominent speakers— including Madeleine Albright and John McCain—and topics that ranged from the future of the financial system to U.S.-Russia relations. CFR’s Corporate Program continued to strengthen and diversify its membership base of some 163 companies, with the addition of Allen & Overy LLP; C. R. Bard, Inc.; EMD Serono, Inc.; Facebook; Finmeccanica North America; Fluor Corporation; Pitney Bowes Inc.; and Stryker Corporation, as well as upgrades by existing members Citi, which increased to the Founders level, and Google, Inc., and Prudential Financial, which have joined the President’s Circle. 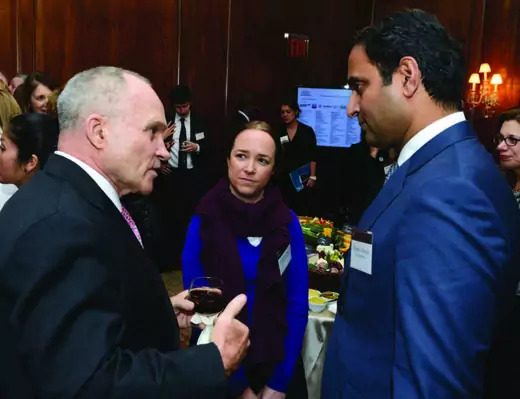 New York City police commissioner and Distinguished Visiting Fellow Raymond W. Kelly speaks with Cecilia De La Macorra of Exxon Mobil and Dylan C. Pereira of Barclays during this year’s Corporate Conference. The Corporate Program’s quarterly breakfast series hosted senior executives from member companies for informal conversation with CFR experts. Highlights included Timothy F. Geithner, Tom Donilon, Michael Levi, Robert Kahn, and Martin Wolf on topics including sanctions, energy, and the global economy. The CEO Speaker series meetings continued with Stephen A. Schwarzman of the Blackstone Group L.P., Christophe de Margerie of TOTAL S.A., and Paolo Scaroni, formerly of Eni. The eleventh annual Corporate Conference drew nearly four hundred executives and featured former New York City mayor Michael R. Bloomberg, former New York City police commissioner and Distinguished Visiting Fellow Ray Kelly, former International Monetary Fund chief economist Kenneth S. Rogoff, Princeton University economist and CFR Board member Alan S. Blinder, and former treasury secretary and CFR Co-Chairman Robert E. Rubin. By offering dedicated meetings and access to select CFR publications and events, the Outreach Program serves as a resource for constituencies with growing influence over U.S. foreign policy—including religious leaders, educators and students, and state and local officials—on issues of pressing international concern. The Religion and Foreign Policy Initiative provides a forum for religious leaders, scholars, and policymakers to discuss topics at the nexus of religion and U.S. foreign policy. The initiative delivers resources through a variety of channels, organizes briefings and meetings, and hosts scholars and faith leaders at the annual June workshop for conversations with CFR fellows and other leading experts. This year’s workshop was the most diverse to date, with representatives from thirty-four faiths in attendance. The initiative also hosts a bimonthly conference call series that provides a forum for cross-denominational discussion of international concerns. Calls this year covered Egypt, Myanmar, Syria, the Central African Republic, the Israeli-Palestinian peace process, religion and politics in India, securalism and religious freedom, Salafi involvement, and countering violent extremism. CFR Board member Mary McInnis Boies leads a discussion on geopolitical risk with CNN’s Fareed Zakaria and CFR President Richard N. Haass. The Academic Initiative provides educators at the secondary and postsecondary levels with tools to foster a broader awareness of foreign policy, including teaching modules for CFR publications and interactives, and offers students resources to help them develop a meaningful understanding of the world. The annual Educators Workshops for college and university professors and high school teachers include substantive briefings by CFR scholars on international issues and introduce participants to the wide array of CFR educational programming. Events for students, including the Academic Conference Call series, provide them with the opportunity to interact with CFR fellows on a variety of subjects that this year included the state of U.S.-Pakistan relations, global governance, and China’s search for natural resources. Through the Washington Program, CFR delivers truly nonpartisan resources to government officials. This year, experts offered analysis on a wide range of pressing international issues to members of Congress and their staffs in more than 150 briefings and roundtable meetings and provided access to CFR materials and background on upcoming hearings in the House and Senate. Fellows have been called to testify before the 113th Congress nearly thirty times on issues ranging from Syria to immigration reform. Experts also met frequently with executive branch and diplomatic officials, briefing senior policymakers at the Departments of State, Defense, and Homeland Security, the Office of Management and Budget, the Office of the U.S. Trade Representative, and other agencies throughout the U.S. government. CFR’s digital content and interactives have driven significant traffic to the website. Senior Fellow Laurie Garrett’s Vaccine-Preventable Outbreaks map drew some five hundred thousand page views over just ten days in January. Senior Fellow John Campbell’s Nigeria Security Tracker, which uses maps and graphs to document violence and unrest in that country, has been widely cited in news stories, State Department meetings, and congressional briefings. These are just two of many examples of digital content from the think tank, Meetings Program, and CFR.org editorial team that brought visitors to the website and helped double the interest in CFR’s social media channels—Facebook, Twitter, and YouTube—this year. In September, CFR.org’s editorial team launched an award-winning new multimedia series, InfoGuides, which combine written analysis, video interviews with experts, and interactive elements such as maps, timelines, and infographics to explore complex foreign policy issues in depth. CFR released three InfoGuides this year: “China’s Maritime Disputes” focused on escalating tensions in the South and East China Seas; “Child Marriage” analyzed the practice as a threat to prosperity and stability in countries where it is prevalent; and “The Emerging Arctic” examined both the economic opportunities and environmental risks posed by melting Arctic ice. InfoGuides are an innovative addition to CFR’s existing online offerings, including the International Institutions and Global Governance program’s Global Governance Monitor, another award-winning tool that maps and evaluates efforts to tackle transnational threats; and CFR.org’s popular Backgrounder series. Seventy Backgrounders—including primers on the crisis in Ukraine, the Nigerian terrorist group Boko Haram, and the Islamic State in Iraq and Syria—were recently relaunched to a mobile- and tablet-optimized, user-friendly microsite.